Over a large mixing bowl, use a vegetable peeler to cut the zucchini and yellow squash into long, thin ribbons. Drain the soaked red onion and carefully toss with the squash along with the cherry tomatoes, sliced cucumber and chopped mint or basil. Add the lemon juice and olive oil and toss carefully to coat all ingredients. Season to taste with salt and pepper. On a large serving platter, arrange the sliced heirloom tomato in a single layer to create a base for the salad. Season with salt and pepper. 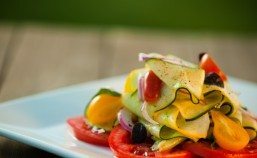 Arrange the squash salad on top of the tomato slices, garnish with the goat cheese, pine nuts and chopped olives, if using. Serve immediately. skin should come off easily. Quarter the roasted beets and place in a medium mixing bowl. Toss with the lemon juice and remaining olive oil, and season to taste with salt and pepper. Serve cold, hot or warm. Tear the kale leaves from the stems. Cut kale leaves in to 1 inch ribbons and wash thoroughly in cold water. Drain. Place the olive oil, garlic and chili in a large skillet. Heat over medium flame, stirring occasionally, until the garlic just begins to brown – be careful not to burn! As soon as garlic begins to brown, quickly add the wet kale. Stand back as the pan may splatter a bit. Cook the kale, stirring occasionally, until it is wilted and slightly tender – about 5 minutes. If the pan becomes dry, add a few teaspoons of water. Season to taste with salt and serve immediately. Place the olive oil and bacon in a large pot over medium heat. Stirring occasionally, cook until the bacon just begins to brown. Add the onion and garlic and cook until soft – about 10 minutes. Begin adding the washed collard greens. Add as much as can fit in the pot at a time; they will steam and cook down quickly. Add more as there is room in your pot. Add a few tablespoons of water as needed to help wilt the collard greens. Cook greens, stirring frequently, until soft and flavorful – about 25 minutes. Add the vinegar and cook another 5 minutes. Season to taste with salt and pepper and serve immediately. Cook the bacon in a heavy skillet on the stove top to desired doneness. Drain on paper towels and keep warm, reserving ¼ cup hot bacon fat. Set aside. In a large bowl, combine the spinach, persimmon, apple, onion and walnuts; toss to combine. Add the vinegar and mix well. Slowly drizzle in the warm bacon fat, toss well. The spinach should wilt slightly with the heat. Crumble in the cooked bacon and toss to combine all ingredients. Serve immediately! Note: This salad would be fantastic with a little crumbled blue cheese! Preheat oven to 400F. Line the bread slices on a baking sheet, brush with the olive oil and toast until lightly browned. Remove from oven, reduce the temperature to 375, and set aside. from the heat. Whisk in half of each grated cheese and set aside. In the bottom of a large casserole dish, spoon a little of the cream sauce to coat. Add a single layer of the toasted bread slices and spoon the cream sauce over the top to cover. Add a layer of tomato slices, then a layer of zucchini and yellow squash. Season the vegetables with salt and pepper, and spoon more of the cream sauce over top. Add another layer of the bread slices, then the vegetables, always coating with the cream sauce. You should end up with two layers of bread and two layers of vegetables. Top the casserole with the remaining cream sauce, then sprinkle with the remaining cheese. Bake in the hot oven until heated through and bubbling around the edges, about 25 minutes. Switch the oven to broil and cook until the top of casserole is nicely browned, about 2 minutes more. Remove from the oven, let stand for 10 minutes before serving. leaves. Season well with salt and pepper and toss to coat evenly. Serve immediately.